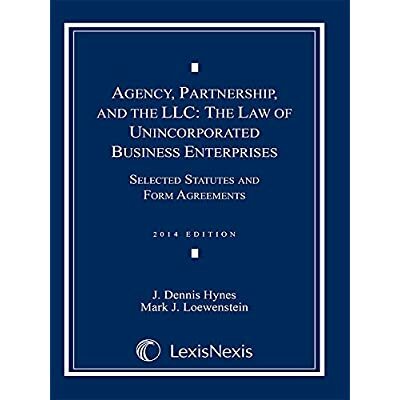 This supplement makes available the complete text of the statutes essential for a study of the law of partnership, the limited liability partnership, and the limited liability company (LLC). It includes the Uniform Limited Partnership Act (2001); earlier iterations of uniform limited partnership acts (the 1916 act and the 1976 act with 1985 amendments); and the two versions of the uniform partnership acts, the Uniform Partnership Act (1914) and the Uniform Partnership Act (1997)("RUPA"). Also, the most recent amendments to the Uniform Limited Liability Company Act ("ULLCA") are included.All of the comments to all of the statutes have been reproduced in their entirety, with the exception of the original Uniform Partnership Act (1914) ("UPA"). A sample LLC operating agreement and a sample partnership agreement usable in jurisdictions that have adopted RUPA are contained in the supplement.This supplement can be used in an agency, business associations or business enterprises course.